Ar Tarn went into the game on the back of two defeats in a row in the Future Lions United Counties League Premier Division. But they hit back against a Nirvana side who had seen their Buildbase FA Vase hopes ended in a fifth-round defeat at Canterbury City at the weekend. Will Arnold opened the scoring for Desborough before Jake Bettles and a Jason Turner penalty wrapped things up. Desborough are on their travels at the weekend as they go to second-from-bottom Kirby Muxloe. All the games involving local clubs in the Premier Division fell victim to the weather last weekend. And Wellingborough Town are set to return to action with a tough test as they make the trip to take on second-placed Rugby Town on Saturday. 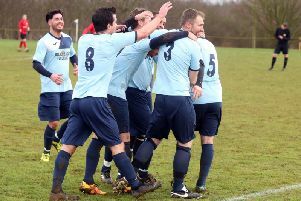 Rothwell Corinthians will be hoping to boost their survival hopes when they entertain Eynesbury Rovers at Sergeants Lawn. And there is a huge game at London Road as rock-bottom Whitworth will bid for some crucial points when they host another struggling side in the form of Boston Town. Jake Reynolds was the late hero for Rushden & Higham United in Division One on Tuesday night as they picked up a second successive away win with a 2-1 verdict at St Andrews. After a goalless first half, the Lankies took the lead through Nat Gosnal-Tyler before the hosts levelled. However, Reynolds popped up with the winner in the dying minutes to secure the points for Wayne Abbott’s team. 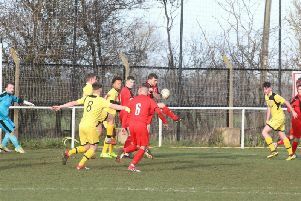 The only local club to play in Division One last weekend were Irchester United and they would have been delighted their clash at Huntingdon Town went ahead. Steve Sargent’s team fought back from 2-0 down at half-time to claim a 5-2 success. Ryan Lovell started the comeback on 65 minutes before two goals from James Ball, and further efforts from Nathan Heycock and Tom Gordon sealed the victory. Irchester are now unbeaten in four matches and will hope to extend that record when they host bottom side Raunds Town on Saturday. Elsewhere this weekend, there is a crucial game at the foot of the table as Burton Park Wanderers, who saw their midweek clash with Sileby Rangers postponed due to the visitors being unable to raise a team, take on fellow strugglers Thrapston Town in a local derby at Latimer Park.